Then start painting! I read that on FB last week or something like that and it struck my nerve. It was what a professor (or was it a recognized artist?) said to a guy who doubted his capability to paint great paintings. It’s so right – if you want to achieve something, you have to keep on doing it, you can’t just sit on your a-s dreaming, wishing. But honestly, I don’t aspire to be an artist, only to be the best I can. So to be brave, I came to the conclusion that I can’t keep on auditioning stars of different colors over and over again and instead have to go with my gut feeling and take a stand , otherwise this will truly be an infinity project. 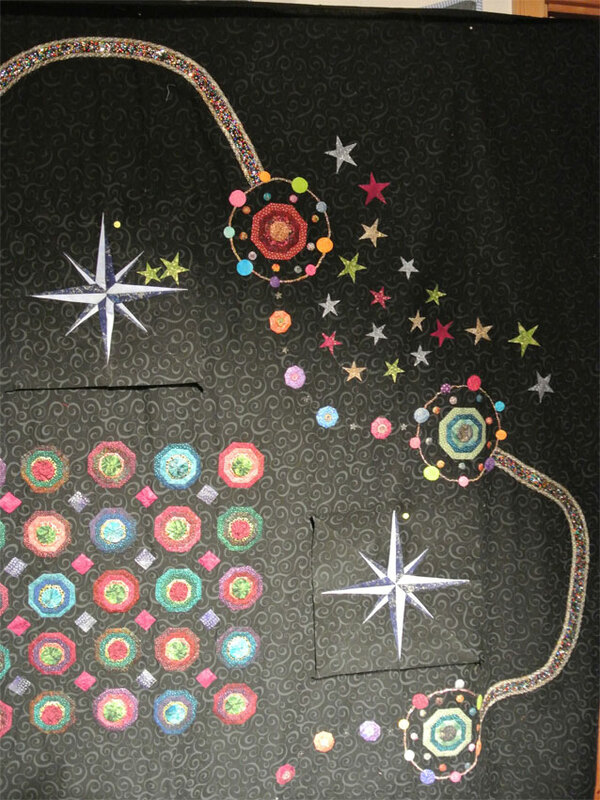 So here is what I have come up with and will stick too: gold, silver, green and fuchsia: Might ad some of the smaller stars along the bollywood bends. I did try the same colors as in the compass needles, but the dark blue didn’t show up in such tiny pieces. So later on (or maybe tomorrow ) I will take a deep breath and be brave enough to iron the stars to the background and after that it’s definite. He looking at the picture I see two starts along the upper compass needles, but they placed there temporarily, kind of storage and will not be in the design.